At its launch, the FW26 was clearly distinct of competing Formula One cars due to its 'tusk nose', also called 'walrus nose'. The new concept was thought out at the aerodynamic department of Williams, led by Antonia Terzi. After the jumped ship from Ferrari, she had also been involved in the design of the Williams FW25 but was granted more freedom for this new car. The FW26 sports a short and fairly stumpy nose which was aimed at optimising the airflow under the nose cone. Based on that same idea, the front suspension was also completely redesigned to a twin keel design. Because of this cleaner front, less drag was induced at the front, allowed to better channel the air towards the sidepods and the rear end of the car. Overall, this caused greater aerodynamic efficiency for the entire car. The front wing meanwhile was mounted with two vertical curved panels starting from each side of the nose cone. The team launched the car as early as 5 January to allow the team to test the car better before the start of the season: "We were conscious that the inability to extract the full potential of the FW25 until well into the season", said Chief Designer, Gavin Fisher. "It was a significant contribution to our failure to win either Championship. The earlier launch date for FW26 is a clear statement of our intent to be in a position to win from the first race onwards." Fisher continued stating that the FW26 is not an iteration of its predecessor, which might surprise some people given the former car's relative success: "You cannot stand still or relax your development pace for a single minute in Formula One." When pressed to define the FW26, Fisher confesses a dislike for the use of the term ‘radical', “It is devalued because it is over-used”, he reflects, "And to a large extent the possibility is excluded by the restrictive technical regulations that govern Formula One. That said, it will be immediately evident to onlookers that a high degree of innovative design has gone into the FW26". Not so much an iteration, but a step change, and as such, the second carried out by the WilliamsF1 design team in as many seasons. On the engine side, the BMW P84 builds on the foundations of the P83. It was designed under the management of Heinz Paschen, Head of BMW Formula One Development. Compared to its predecessor, all components were modified to respond to the new regulations - using the engine over the entire weekend means doubling the life of the engine to 800 kilometres. Despite these rule changes, BMW was able to keep the engine's dimensions and weight virtually the same, while further improving its performance. Work on the new V10, again with 90 degree bank angle, began in November 2002. Test rig trials and initial track tests were conducted in the summer of 2003. In winter testing, the car didn't pose any major problems and proved to have a good pace. Immediately after the first shakedown, Juan Pablo Montoya commented: "My first impression of the FW26 is very good. The car doesn't feel a lot different from last year's, which is a very good start and I think we have an excellent potential car. I felt comfortable right away and could push the car from the outset, so thanks to the team for having built a very promising car." "In spite of the restrictions imposed by the new rules, which give you less drag and make the car more difficult under braking, everything feels just right. The dusty track conditions were not 100% ideal today and we only completed six hard laps, so I don't want to sound too optimistic, but there isn't a single area that doesn't work. I am very, very pleased, I think this car has got a good future." Once in race conditions though, it quickly proved not to be a contender for the title. By mid-season the team struggled to hold on to Renault F1 and B.A.R Honda F1 and was no match for the dominant Ferrari F2004. Despite the early testing pace and the amounts of CFD work, the car suffered from the weight of the nose - which turned out higher than expected to meet the frontal impact test - and hence the car's stability. Williams consequently decided to redesign the nose and fit a more conventional one by the time they arrived at the Hungaroring. Things quickly improved and Montoya was even able to secure the car's only win in the season finale at Interlagos, Brazil. 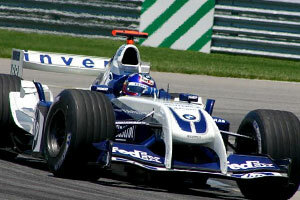 Williams finished fourth in the 2004 Constructor Championship with 88 points. Driver's seat: Anatomically formed in carbon/epoxy composite material with Alcantara covering.